For instance the conceptual distinction between is and ought obscures their interpenetration in the evaluative aspect of everyday life. We are, as he puts it, “needy, vulnerable beings, suspended between things as they are and as they might become, for better or worse, and as we need or want them to become” (Sayer 2011: 4). We might say that our subjective evaluative responses are objectively part of any state of affairs that can be studied and they are subjectively meaningful responses to objective circumstances. But in doing so the limitations of these concepts becomes clear, with clarity of expression rapidly lost as we strain against the tendency of these distinctions to foreclose certain ways of thinking and speaking. Another related example is the distinction between facts and values. Some try to avoid value judgements because they are understood to preclude objective assessment of facts. Others critique the ambition of an ‘objective assessment of facts’ because such an endeavour is seen to be impossible because unavoidably value-laden. Both these positions start from the assumption that objectivity and values are incompatible. Thus Sayer seeks to shed the conceptual structure which generates the problems rather than engaging in what he has elsewhere terms a ‘PoMo flip’ where a reaction to a problematic position involves a simple inversion and retains the conceptual structure which generated the problem in the first place. One aspect of the book I found particularly thought provoking was Sayer’s account of value. On his view values should be understood as past evaluations sedimented as present dispositions which we believe to be justified. This view sees value as “based on repeated particular experiences and valuations of actions” while also tending “recursively, to shape subsequent particular valuations of people and their actions, and guide that person’s own actions”. They are “habits of thinking to which we become committed or emotionally attached” (Sayer 2011: 26-27). This goes hand-in-hand with a broader argument that “we should think of normativity more in terms of the ongoing flow of continual concrete evaluation, and less in terms of norms, rules, procedures, or indeed decisions and injunctions about what one ought to do” (Sayer 2011: 97). This puts Sayer in conflict with someone like Elder-Vass who, despite a somewhat similar theoretical starting point, offers an account of normativity in terms of the causal power of social groups. As a number of people have pointed out, his concept of norm circles lacks a diachronic account. It might offer useful insight into whose action contributes to which social injunction at a particular point in time but it struggles to explain how this propensity to enforce norms comes about over time. To adequately explain the endorsing of norms requires an account of value. Without this it becomes difficult to comprehend what motivates normative behaviour unless we wish to argue that the norm circle effectively brings itself into being. 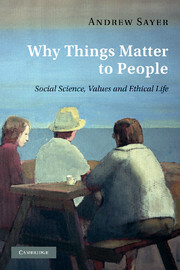 Why Things Matter to People is a rich and complex book. It is unavoidably filled with abstract terminology and at times Sayer’s frustration with the constraints of theoretical discourse is almost palpable – he deserves eternal credit for acknowledging early in the book that ‘lay normativity’ is a rather alienated way of describing its object. Nonetheless the entire project is animated by his concern to understand this everyday yet so frequently overlooked dimension of human life. For something so intrinsically abstract it’s also weirdly readable. I find the sensitivity with which Sayer does theory deeply admirable, as well as the clarity with which he writes about what it is he has done. The book is a pleasure to read and that’s something I have rarely found to be true of social theory, regardless of how accomplished the works in question might be. In short I can’t praise this book enough. Now I need to resist the urge to reread the whole thing when I only picked it up again to check a reference and ended up writing this post. This great article by Michael Billig (HT Dave Beer) makes an incisive point which echoes a powerful argument in Andrew Sayer’s last book. Sayer argues that the pervasive disregard for ‘lay normativity'[*] within social science (i.e. what matters to people and why) helps produce a vision of the social world which is alienated and alienating. Perhaps the pervasive tendency for social scientists to nominalise as part of their process of conceptualisation helps entrench this situation, as every occasion of linguistically distancing ourselves from concrete actors leaves us ever further from the ethical texture of everyday life. The result is an eviscerated view of the social world, with an apparent explanatory plausibility belying the loss of a significant part of the first person experience of being human. One of the things that most interests me is the possibility of sustaining the capacity for abstraction which brings about this state of affairs but doing so in a way which preserves lay normativity. Without the former, sociology becomes merely descriptive (in which case I’d much rather read essayists, journalists and novelists thanks) but without the latter its explanatory function is, at best, truncated. However I don’t think the problem can be reduced to questions of theory or methodology. Nor even is it a matter of style per se. Instead is there a problem of the value placed on communication? Or rather the lack thereof. One of the thoughts that I’m untangling in my own mind (and likely will be for some time) is the status accorded to the communication of sociological knowledge and whether ‘public engagement’ represents a potential avenue through which the communication of knowledge is rescued from its longstanding relegation to a secondary status. If communication were valued more would people write in such a rush? Though I can’t escape the irony that I am rushing to finish writing this post so that I can get on with other things. This contradiction, between an increasingly attractive idea of ‘slow theory’ and ‘slow scholarship’ in my head and the reality of what I actually do, does kind of bother me. It’s little things like returning to blog posts to edit them. It’s so easy and quick to do. But it’s often difficult to get myself to do it and it feels like a chore, in spite of the difference I know it makes to the quality and coherence of the writing. Though another way of looking at this occurs to me. Perhaps the ‘rushing’ is a consequence of the value I place on writing rather than the lack thereof. Or rather the expression of an idea, using writing as a medium to move it from something inchoate to something which I have articulated (and will inevitably do so again and again in an iterative process of saying what I’m trying to say). I feel rushed when an idea is live in my mind and beyond speculating that this is because I really enjoy the process of expressing it, I’m not really sure why this is. It’s also when writing becomes indescribably easy, as words flow when an idea is at the forefront of your mind and gradually cease to flow as the idea comes to feel something more external (objectivised in text) than internal. I find it extremely difficult to write without a live idea in this way. For a long time I had a file of ‘blog post ideas’ which I eventually gave up because I almost never wrote any of them. *Which to his eternal credit he acknowledges as a rather alienated way to express the idea. Faced with theoretical or philosophical positions that seem untenable, it is tempting to counter them by reversing or inverting them, for example, responding to empiricism’s belief in the rooting of knowledge in empirical observation by claiming knowledge to be independent of observation and observation to be wholly dependent on discourses. This strategy retains the problematic structures which generated the problems in the first place […] Defeatist postmodernism typically defines itself in opposition to ‘foundationalism’, ‘objectivism’, and those who claim privileged access to ‘the truth’. In reacting against this, it then flips over into an anti-realism which rules out any possibility of empirical/practical evaluation and makes truth relative to discourse. Realists also reject naive objectivism, but as we argued in the previous chapter, this need not make us flip over into relativism or idealism, or make us doubt the possibility of scientific progress or abandon the Enlightenment project. I shall call the former reaction a ‘pomo flip’, but there are other pomo flips too: from a rejection of grand narratives or totalizing discourses to an incapacitating fragmentation of the world and its discourses; and from a rejection of ethnocentrism, androcentrism and imperialism to an equally self-defeating cultural and judgmental relativism.